The Age of Recovery: Let the Sunshine In! This 3 CEU workshop will be presented by Melanie Gordon Sheets, Ph.D. from 1:30 – 5:00 pm on July 28th, 2011. This workshop will provide an introduction to the workbook based DBT-CBT recovery program, a modified DBT program for individuals with affective disorders and destructive coping behaviors, such as substance abuse, self-injury, suicidal threats, verbal/physical aggression, eating disorders, overshopping, etc. Some key recovery concepts, skills, techniques, and understandings will be discussed and illustrated via the completion and review of several program worksheets. Participants will gain information about the structure of the DBT-CBT program, target populations, problems addressed, and utility in various treatment settings and by various providers including peer support specialists. Participants will understand the basic dynamics of Emotional Mind which drive emotional dyscontrol, relief-seeking destructive coping behaviors, and the Cycle of Suffering. Participants will gain familiarity with the use of the Wise Mind Worksheet to work through destructive emotional states, thoughts, and impulses to facilitate constructive problem-solving and life-enhancing coping responses. The opening of the workshop will be conducted in didactic fashion to provide a basic overview of the DBT-CBT program; however, the program will concentrate on modeling the psychotherapeutic / psychoeducational process of the DBT-CBT inpatient recovery group held at Big Spring State Hospital (BSSH). Twelve volunteers will be solicited from the audience to function as “group members” for this portion of the program. A question and answer period will be offered during the latter portion of the presentation. Dr. Sheets is the Chief Psychologist at Big Spring State Hospital, the Co-Director of the Lone Star Psychology Residency Consortium internship program, a Clinical Assistant Professor at Texas Tech University School of Medicine, Department of Psychiatry, and the author of the DBT-CBT “Out-of-Control” recovery workbook. She began her career as a mental health technician at Richardson Medical Center in 1985 helping individuals with agoraphobia, substance abuse, depression, Bipolar Disorder, and Borderline Personality Disorder. She earned a doctorate in clinical psychology in 1992 from Texas A&M University where her training emphasized psychoanalytic and Jungian psychotherapy methods. She completed her pre-doctoral internship at the Dallas VA Medical Center in the PTSD Clinic, the Substance Abuse Unit, and Inpatient Psychiatry units. She has conducted the DBT-CBT Group since 2004 for forensic, VA, and general psychiatric inpatients. 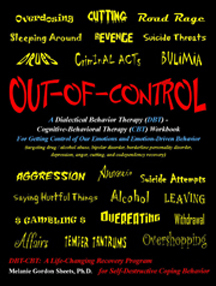 The full title of the therapy workbook is “Out-of-Control: A Dialectical Behavior Therapy (DBT) – Cognitive-Behavioral Therapy (CBT) Workbook For Getting Control of Our Emotions and Emotion-Driven Behavior (targeting drug / alcohol abuse, bipolar disorder, borderline personality disorder, depression, anger, cutting, and codependency recovery)” – published by Recovery Works Publications (2009). Dr. Sheets will be presenting on the DBT-CBT Workbook program at the Houston Chapter of TAAP Spectrum 2011 Conference in September 2011 and at the North Texas State Hospital Forensic Conference in October 2011. Details will follow. By joining NAADAC, you will automatically become a member of TAAP if you reside in Texas. As a member of NAADAC, you will receive numerous benefits designed to help you grow and prosper as an addiction professional. NAADAC has memberships available for professionals, students, and even organizations! The information below is excerpted from the TAAP website. TAAP is the Texas State Affiliate to NAADAC. NAADAC, The Association for Addiction Professionals, is the largest national organization for addiction-focused health care professionals with 11,000 members. NAADAC is dedicated to the professional growth and development of addiction specialists. TAAP seeks to promote the advancement of Addiction Professionals by uniting alcoholism and other addiction counseling professionals throughout Texas. TAAP organizes and charters local chapters in Texas, and assists in stabilizing and increasing their membership. By means of legislative initiatives, promotional campaigns and professional networking opportunities, TAAP will promote awareness of the disease of chemical dependency and other addictions and compulsive behaviors. TAAP will advocate for standards for licensure and certification of qualified counselors to ensure the competency basis of those who counsel alcoholics and other addicts and their families and assure a high order of professional standards and ethics among those in the addictions counseling profession. TAAP is a confederation of individual counselors, prevention specialists, and other persons who have a direct interest in the field of addiction. While the bulk of our membership is comprised of those professionals dedicated to the recovery of alcoholics and drug abusers and their families from the devastating illness of alcoholism and drug abuse, many of our members serve a clientele that suffer from other addictions as well. United, we have a voice in important and critical matters relating to our association and profession, as well as those we serve. This unity enhances our capability as individuals and gives us strength in professional matters. Through a united effort, we are more likely to be recognized in legislative arenas. Together we can work in partnership with state and federal agencies that regulate our industry, and we can promote public policy that will help us meet our goals. The organization evolved and became known as the National Association for Alcoholism and Drug Abuse Counselors (NAADAC) in 1982, uniting professionals who worked for positive outcomes in alcohol and drug services. It’s new name is NAADAC, the Association for Addiction Professionals. The name change reflects the increasing variety of addiction services professionals: counselors, administrators, social workers and others, who are active in counseling, prevention, intervention, treatment, education and research.